I have discussed the importance of SHBG, the protein that binds tightly to your testosterone in the plasma, as a sign of health. Too much SHBG and you may find your free testosterone significantly lowered. Actually, men who have low or high SHBG tend to not feel well. The key is that this binding protein, SHBG, is at ground zero for men's health. And what is one of the things that can raise a man's SHBG? Estradiol. The story does not end there: both men and women actually have many binding proteins. We have one for cortisol. And we have one for thyroid hormones, which is called TBG. And guess what can also raise a man's TBG? Again, the answer is estradiol. NOTE: T4 is converted into T3. However, T3 is the more biologically active form of your two major thyroid hormones. Hypothyroidism is very common in men and getting checked for this condition is part of what I call the PeakT Program. (See my home page for information.) As you'll see in my link Testosterone and the Thyroid, hypothyroidism can lower testosterone levels. 1. Decreased Free T3 and T4. All things being equal, as TBG goes up, you have less free T3 and T4 to work on your tissues. Again, this is similar to men with high SHBG, who end up with less free testosterone. Researchers have noted that "estrogen has a well-known indirect effect on thyroid economy, increasing the thyroxine binding globulin, and the need for thyroid hormone in hypothyroid women." In other words, if you give a woman estrogen, she will actually need more thyroid medication. Although understudied, the same relationship will hold in men. 4. Increased Risk of Hypothyroidism. Women have 8 times the risk of developing hypothyroidism compared to men. It seems to be well-accepted that this is due to their estradiol levels. Okay, so estradiol can possibly make one hypothyroid. What is the significance? First of all, the typical male, as he heads into middle or senior age, may easily be packing on anywhere from 30-60 extra pounds of weight. This is extremely common, especially in the U.S. where a third of adults are overweight and a third are obese. A typical BMI for a middle-aged male might be 25. If he is in his early senior years, this probably translates to about 26% body fat. (There are are formulas for estimating body fat from BMI by age for males. You can run through the numbers if you'd like.) Now a man probably should be around 13 or 14% body fat and, sure enough, if you do the math, this means losing about 26 pounds of fat. Now that may not seem like that much, but it's a lot of adipose (fatty) tissue. And remember that fat cells, as they increase in size from weight gain, accumulate extra aromatase enzyme. This means that more and more of a man's testosterone is converted into estradiol by that extra fatty tissue. Yes, enough weight gain literally emasculates you. In fact, as you can read in my link on Testosterone and Weight Loss, a man can actually make himself hypogonadal if he is 50+ pound overweight. It is quite common actually. Now, if you're struggling with a lot of extra pounds, I'm not being critical, but I think it's important to let you know that you could be greatly increasing the estradiol load on your body. And researchers have noted that too much weight gain can make you hypothyroid as well. Do you see the vicious circle? Now you need to lose weight to get your testosterone and thyroid function back, but you've slowed down your metabolism. This means weight loss is just that much harder. Of course, there are guys with 30 pounds of extra weight that have decent testosterone and no signs of hypothyroidism. But why take your chances? Getting in a duel with Mother Nature is just not a good idea. There is another equally sinister way that those extra pounds may negatively impact your thyroid. Significantly overweight and obese men tend to have higher inflammation levels and inflammation slows the conversion of T4 to T3. Remember that T3 is the most powerful thyroid hormone. HRT (Testosterone Therapy) Impact? Traditionally HRT clinics have tried to keep men in the 20-30 pg/ml range for estradiol from what I have seen. The explanation was that these represented healthy, youthful estradiol levels and that many men feel better lowering their estradiol. 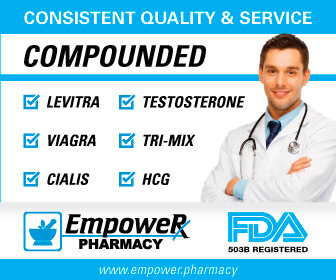 I would concur that many men on the The Peak Testosterone Forum have reported improved morning erections and other symptoms if their estradiol is not too high as well. However, there is a new "movement" among many docs to just let estradiol go and not control it. There are many reasons for this and I am certainly not being critical. However, if your estradiol is high from HRT and you are hypothyroid, it may be worth discussing with your doctor. Contradicting this is the fact that Arimidex is not supposed to affect thyroid function in healthy individuals. 1) N Engl J Med, 2001 Jun 7, 344(23):1743-9, "Increased need for thyroxine in women with hypothyroidism during estrogen therapy"
2) Journal of Thyroid Research, 2011, "Role of Estrogen in Thyroid Function and Growth Regulation"
3) Molecular and Cellular Endocrinology, Mar 25 2010, 316(2):165-171, "Obesity and thyroid function"